The private Danish industry initiative, Green Ship of the Future, have concluded a study on comparing technologies that meet the International Maritime Organization’s emission levels for ships sailing in the Emission Controlled Areas (ECA). 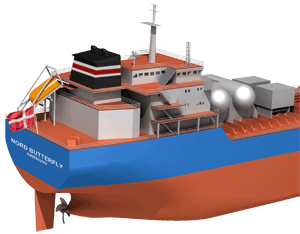 The background for the study is The International Maritime Organization (IMO) decision that all vessels sailing in the ECA must reduce Sulphur level in fuel oil to 0.1 % or clean the exhaust gas to an equivalent level by 2015. 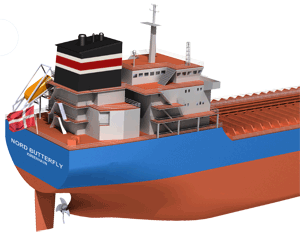 The basis for the project was a newly built 38,500 DWT tanker from D/S NORDEN A/S. The group behind the study consisted of Alfa Laval - Aalborg (former Aalborg Industries), D/S NORDEN, Danish Shipowners’ Association, Elland Engineering, Lloyd’s Register, Maersk Maritime Technology, Maersk Tankers, MAN Diesel & Turbo, Schmidt Maritime and with the Green Ship of the Future secretariat as coordinators. The project was jointly funded by the Danish Maritime Fund and the participating companies. Please click on the links below in order to download further information on the study. Download the brochure with the conclusions in short. Nord Butterfly equipped with the scrubber solution. Nord Butterfly equipped with the LNG solution.